As warmer weather has spread through much of Wisconsin, I have talked with more and more gardeners who are chomping at the bit to get into their yards and start the 2019 gardening season. One of the activities these gardeners are contemplating is the pruning of their trees and shrubs. They often ask me whether spring is a good time to prune from a plant disease perspective. Overall, I am a proponent of winter pruning. 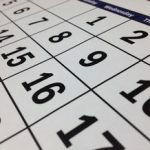 Typically there is a slight warming at the end of January or at the beginning of February where it’s warm enough to prune and not freeze to death, but not warm enough that disease-causing organisms are likely to be active. In my mind, pruning during this window reduces the risk of pathogens infecting through pruning wounds. There can be exceptions to this rule of thumb however. There is some research that indicates that pruning honey-locust trees in the summer (during hotter, drier periods) can reduce the risk of Nectria canker compared to pruning in the winter. When pruning in the spring, the trees that I have the most concern about are oak trees. In particular, I worry about transmission of the oak wilt fungus, Bretziella fagacearum. This fungus can be moved from tree to tree by sap beetles that become active as temperatures warm. These insects are attracted to wounds, including those caused by pruning. Some municipalities restrict pruning of oaks after April 1 in anticipation that temperatures will shortly be warm enough that sap beetles will be active. Use of a calendar date as a cut off for pruning oaks can be problematic however if spring arrives early. For that reason, I really ONLY recommend winter pruning for oaks. If for some reason, you really need to prune an oak at another time of the year, paint over any pruning wounds. You can use a commercial pruning paint if you like, but left over latex paint (from painting a room in your home) will work just as well. The paint provides a physical barrier that makes a wound less attractive to sap beetles. Be sure to paint wounds on oak trees IMMEDIATELY. There is research that indicates that sap beetles can visit wounds in as little as 10 minutes. In general, when pruning tress other than oaks in the spring (or any time other than the winter), always be sure to prune when it’s dry and when there is dry weather predicted for several days post pruning. Dry weather is less favorable for fungal spores (which might land on a pruning cut) to germinate and infect. Also be sure to prune properly based on the type of tree or shrub. Laura Jull of the UW-Madison Department of Horticulture has authored several excellent fact sheets on how to prune evergreens, deciduous trees and deciduous shrubs. Check these out!! When pruning out diseased branches, prune four to six inches below obviously diseased areas if you suspect a fungal disease and 12 inches below obviously diseased areas if you suspect a bacterial disease. In the best of all possible worlds, you should decontaminate your pruning tools between every cut to limit possible movement of pathogens via your tools from branch to branch or from tree to tree. 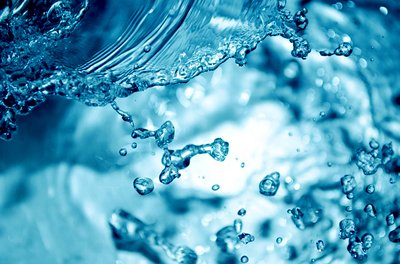 You can use a 30 second dip in 70% alcohol (e.g., rubbing alcohol) or in a commercial disinfectant for this. Alternatively, you can use a spray disinfectant, spraying your tools until they drip and then allowing them to air dry. Except in situations where oaks are pruned during the growing season, I do not recommend using paint on pruning cuts. Paints tend to slow down the formation of callus tissue, the tissue plants produce to naturally cover over wounds. 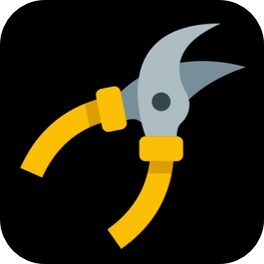 Finally, avoid what I tend to try to do when I prune, which is to prune off my fingers. OUCH!! 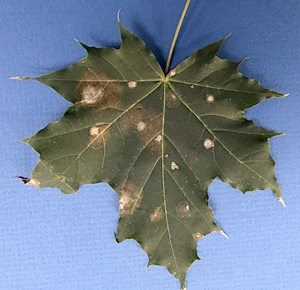 For addition information on plant diseases, the PDDC and its activities, check out the PDDC website, follow the clinic on Twitter or Facebook (@UWPDDC) or contact the clinic at pddc@wisc.edu. Recently, I have seen an increase in conservatory and greenhouse-grown plants arrive at the PDDC. It’s certainly the time of year that greenhouses gear up their plant production in anticipation of spring sales (assuming that spring is going to arrive this year – I have my doubts). 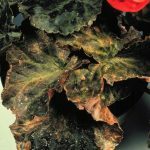 There are several viral diseases that I routinely see in home and greenhouse-grown plants that, if undetected, can spread easily and pose challenges for both indoor and outdoor gardeners. I recently received several orchid samples from a local conservatory. As it turned out, several of the plants were infected with Cymbidium mosaic virus (CymMV), an orchid specific virus. In some orchid species, CymMV causes few, if any symptoms. 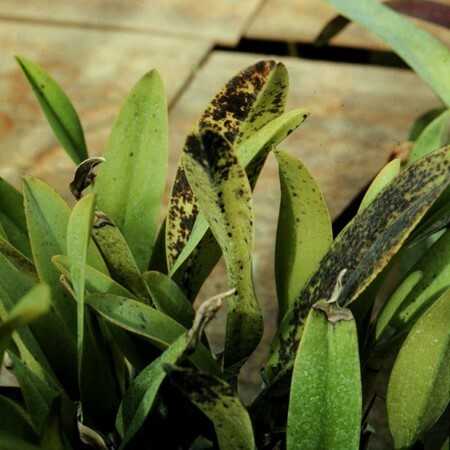 In other orchid species, a typical symptom is the appearance of necrotic (i.e., dead) leaf spots, symptoms that in most other plants I would attribute to fungal or bacterial pathogens. Over the years, I’ve learned that with orchids, testing right away for viral pathogens like CymMV, particularly when there is leaf spotting (and oftentimes even when there isn’t), is a good idea. Luckily, I have a quick, easy-to-use serological dip stick test (the plant virus equivalent to a home pregnancy test) to test for CymMV. When plants test positive, my recommendation is to throw out the infected plants. 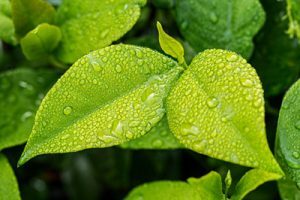 It’s too easy to accidentally move viruses around in plant sap that you get on tools or even your hands when you are trimming leaves or deadheading flowers. Once infected plants are removed, it’s important to decontaminate items that may have come into contact with the plants. For details on what to use, check out the recipes in the University of Wisconsin Garden Facts on Hosta virus X (HVX). HVX is another common plant virus, albeit on hostas rather than orchids. I also recently received a Lysimachia sample with a viral problem that turned out to be a bit more of a challenge to diagnose. The plants came from a commercial greenhouse. I noted that the edges of the leaves were dead and also noted damaged areas elsewhere on the leaves. Some of the damage seemed to be consistent with that due to thrips feeding. This sent up a red flag, as thrips can carry plant viruses like Impatiens necrotic spot virus (INSV) and Tomato spotted wilt virus (TSWV). These viruses can infect a wide range of plants, can spread quickly (it doesn’t take a lot of thrips) and can cause significant economic loss. 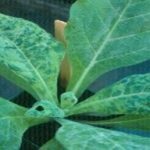 I used dip stick tests for INSV and TSWV, as well as for two other common plant viruses [Cucumber mosaic virus (CMV) and Tobacco mosaic virus (TMV)], but all of these tests were negative. To double-check that my thoughts about possible thrips damage were reasonable, I showed this sample to PJ Liesch, the UW-Madison/Extension insect diagnostician. 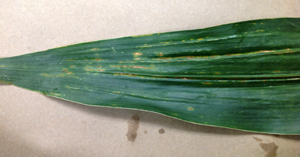 PJ verified the presence of a small number of thrips in the sample, but indicated that the brown leaf edges were not a typical symptom of thrips feeding. PJ was on vacation when this sample arrived and he wasn’t able to look at the sample for about a week after submission. By that time, I had noticed that the plants were developing additional symptoms including growth distortions and botchy color. Everything was pointing to a viral problem. Given PJ’s verification of thrips, I again tested the sample for INSV and TSWV, and lo and behold, this time the sample tested positive for INSV. At that point, everything fell into place and I reported back to my client that I thought INSV was the primary issue with the plants, and recommended plant removal and decontamination. The conflicting results that I got with this sample point out a difficulty in confirming viral pathogens. Dip stick tests require a certain amount of a virus to be present in a sample to get a positive reaction and the amount of a virus in a plant can vary both in terms of the age of the plant part being tested (old vs. young leaves), as well as how long the plant has been infected. 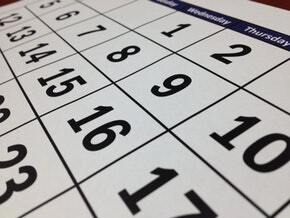 Testing symptomatic tissue of different ages, as well testing more than once over a period of several days, can be critical in making an accurate diagnosis. Finally, the virus that I haven’t yet seen this year (and that I don’t really want to see) is TMV. This virus has a particularly wide host range and is particularly nasty given how easily it can be moved around. You can pick up TMV on your fingers as you handle infected plants and transmit the virus by touch as you handle health plants. TMV is a very stable virus. It not only can be found in live plants, but can also be found in dead/dried plant tissue, including dried and processed tobacco. If you smoke or use chewing tobacco, you are at increased risk of picking up this virus and spreading it around. TMV can also hang around on inert items (e.g., clothing, boxes, work surfaces, tools) and can eventually be moved from these items to plants. TMV, given its stability and easy transmission, is one of the most problematic and destructive viruses that I know of. 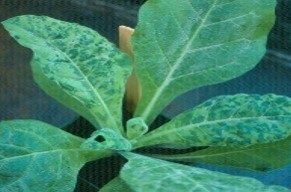 The growth distortions and blotchy color (i.e., mosaic) caused by TMV make infected plants unmarketable. Destroying infected plants, and carefully and systematically decontaminating anything that has come into contact with infected plants is a must to get this virus under control. And if you are thinking of quitting smoking or chewing tobacco, and need another reason, this virus is it. After last week’s sobering, subzero weather, I began to think about all of the ways winter in Wisconsin is designed to make the life of plants, particularly woody ornamentals, difficult. Snow: Snow can be a mixed blessing. I like to see a few inches of snow on the ground, because snow actually has an insulating effect. Without a snow layer, soil temperatures can become quite cold far down into the soil profile and this can lead to cold injury to plant roots. Such injury can outright kill plants, or alternatively lead to a slow, painful death where plants leaf out, but leaves rapidly dry up and die because there is a lack of a functional root system to take up water to supply to the emerging leaves. Excessive snow can also be problematic. In particular, I see situations where white cedars (arborvitaes) become so laden with snow that a variety of problems can arise. In extreme instances, the weight of the snow may be so heavy that branches will snap. In other instances, the snow simply causes the branches to bend downward. This may seem innocuous, but if the snow doesn’t melt away and the plants are weighted for an extended period, branches may not spring back into their normal position and the shrubs end up deformed. Cold Temperatures: Late January’s deep freeze here in Wisconsin likely led to significant plant damage. Plants have particular ranges of temperatures that they can tolerate (usually described in terms of their USDA Hardiness Zone). If temperatures drop outside of this optimal range, physical injury to branches and trunks, and even plant death can result. As I mentioned above, lack of snow cover can make cold injury worse by allowing for additional cold injury to roots. 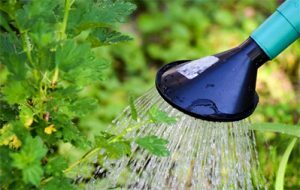 Another contributing factor can be that many gardeners want to “push the envelope” and grow plants (often exceptionally beautiful trees and shrubs) that are not rated for their hardiness zones, but for warmer environments. Often these marginally hardy plants will do well for many years, until they experience an extreme winter. We’ll have to wait to find out how severe this winter’s damage has been until spring arrives. At that point, we’ll be able to see how many trees and shrubs don’t leaf out or are stone dead. I’m expecting plants like Japanese maple, magnolia, redbud and many types of fruit trees (particularly peach and apricot) to be hardest hit. Ice: Now that temperatures have warmed a bit, I’m seeing some areas of Wisconsin experiencing “wintry mixes” of precipitation. Often this means freezing rain, which can coat branches and, depending on the duration of the rain and the specific temperature, lead to thick layers of ice that can be so heavy that they cause branches to break. Some gardeners, in an effort to prevent this breakage, attempt to knock ice from branches, but this technique runs the risk of damaging overwintering buds. I have fond memories (read EXTREME sarcasm here) of an ice storm in the mid-1970’s that caused substantial tree damage, paralyzed Madison and left my family without power for five days. We spent a lot at the mall. Wind: High winds can cause extensive plant dehydration. I most commonly see this as a problem on evergreen trees and shrubs. I think of windy conditions, alone or in concert with cold temperatures, as being particularly damaging on Alberta spruce, boxwood and white cedar (arborvitae). Watch for brown or bleached needles and branch dieback on these plants, particularly as they come out of dormancy in the spring. This damage in often referred to as winter burn. In extreme situations, high winds can physically damage and break off branches. As the December holiday season nears, one of the traditions for many folks is to decorate their homes with festive greens. When selecting wreaths and garlands to using in decorating, keep in mind that you may not only be bringing pine boughs and holly into your home, but also plant pathogens. 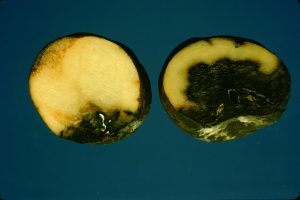 Of particular concern has been the boxwood blight fungus (Calonectria pseudonaviculata). Boxwood blight is a devastating, lethal disease of boxwood, one of our most popular landscape shrubs. Pachysandra (a common groundcover) is also susceptible to the disease. Boxwood blight was first identified in the eastern US in 2011 and this past summer was reported for the first time in Wisconsin in a nursery in Kenosha County. The Wisconsin Department of Agriculture, Trade and Consumer Protection is currently trying to contain and (hopefully) eradicate the infestation. While the greatest potential for introducing the boxwood blight pathogen into an area is through movement of infected landscape shrubs, there have also been reports in other states (e.g., Indiana) of the pathogen having been found in holiday wreaths festooned with sprigs from infected boxwood shrubs. These wreaths were produced in North Carolina and then shipped to other states for sale. The manufacturers unwittingly shipped the boxwood blight pathogen with their wreaths. A similar scenario could potentially occur in Wisconsin, and if contaminated wreaths are not handled properly, extensive spread of the boxwood blight pathogen could result. So, what can you do? First, don’t be afraid to enjoy a holiday wreath; just consider buying one that does not contain boxwood sprigs. If you are unsure whether a wreath you have already purchased contains boxwood, assume that it does (just to safe) and dispose of it appropriately. One option is to burn the wreath, if your municipality allows this. Otherwise, double bag your wreaths in garbage bags, seal them up and place them in your municipal garbage to be landfilled. Be careful to watch for any leaves or branches that may have fallen from the wreaths and collect these up and dispose of them as well. In particular, you want to make sure that no potentially contaminated material ends up near boxwood shrubs that you have in your yard. 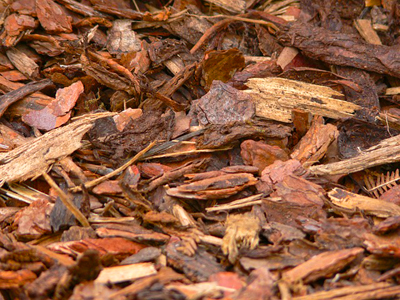 Under NO circumstances should you attempt to compost any suspect boxwood materials. Again, if you are uncertain if you are decorating with boxwood, assume that you are and act accordingly. This is a situation where you can have a huge impact in helping prevent the spread of an economically important disease-causing organism. If you have questions about boxwood blight (or other plant diseases), feel free to contact the PDDC at (608) 262-2863 or pddc@wisc.edu. Also watch for a new University of Wisconsin Garden Facts fact sheet on boxwood blight that should be available on the PDDC website (https://pddc.wisc.edu/) early in 2019. Also feel free to follow the PDDC on Facebook and Twitter @UWPDDC to receive updates on emerging diseases (such as boxwood blight) and their management. Diseases that have not been documented in Wisconsin, but should they be introduced could cause serious damage, and thus early detection is critical for proper management. The disease that currently falls into this category is thousand cankers disease of walnut. This disease has been, for all practical purposes, lethal on black walnut wherever it has been found. The pathogen involved is a fungus (Geosmithia morbida) that is transported by and introduced into walnut trees by the walnut twig beetle. Neither the fungus nor the insect has been found to date in Wisconsin, but I am watching carefully for both. If you see declining walnut trees with yellow leaves and a thin canopy, particularly with small, pin-sized holes on larger diameter branches, get a sample to the PDDC. Invoke the words “thousand cankers disease” and the diagnosis is free. Newly introduced diseases of regulatory importance where documenting how widespread these diseases are can be important for eradication and limit of spread. Boxwood blight falls into this category. This disease is incredibly destructive to boxwoods (lethal in many cases) and was first documented in southeast Wisconsin in late July of this year. Typical symptoms include black spots on leaves and stems, progressing to defoliation, dieback and oftentimes shrub death. Unfortunately, boxwoods tend to be prone to a variety of dieback issues (winter burn being the most common), so I have been telling everyone for several years, “If your boxwood has branch dieback, send a sample to the PDDC, invoke the words ‘boxwood blight’ and get your free diagnosis.” Submissions of these samples are even more critical now that the disease is in the state to figure out how widely distributed this disease is. New diseases to that state that aren’t necessarily of serious concern (at least at this point), but should be documented to keep track of their distribution and/or provide samples for researchers. Corn tar spot falls into this category. Many of you are likely familiar with tar spot of maple. This tree disease (caused by the fungi Rhytisma americanum and Rhytisma acerinum) has been common in Wisconsin for years. 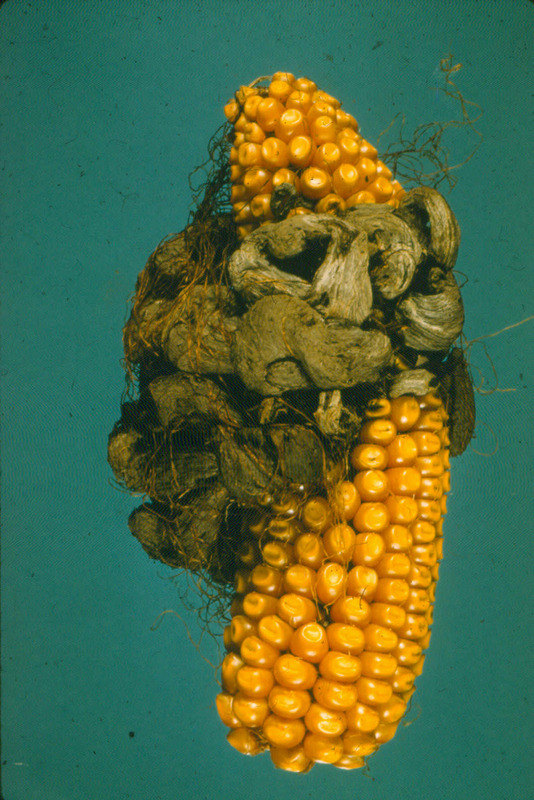 However, in 2016, a visually similar disease (caused by the fungus Phyllachora maydis) was found on corn. At this point, corn tar spot has not been a particularly serious disease, but Diane Plewa (my diagnostic counterpart at the University of Illinois) is studying this disease as part of her PhD research and is interested in obtaining samples of the disease from as many locations as possible. So, if you see corn tar spot in Wisconsin, fill out a corn tar spot survey form, send the form and your sample to the PDDC for a free initial ID (including your complete mailing address so I can get a report to you) and I will forward the sample to Diane. Diseases of extreme economic importance that recur every year. Late blight of tomato and potato falls into this category. Wisconsin is the third largest grower of potatoes in the US and also has a thriving fresh market tomato industry. 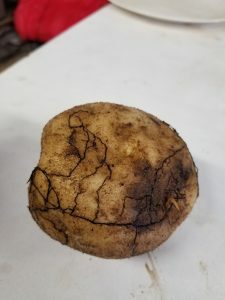 Late blight can be devastating to both (it did cause the Irish potato famine of the 1840’s and 1850’s). Knowing when the pathogen (Phytophthora infestans) arrives and perhaps even more critically which type(s)/variant(s) of the pathogen is(are) in the state (there are many) are important for choosing appropriate fungicides for control. Every year I offer free late blight testing, and I forward positive samples to Amanda Gevens, the UW-Madison/Extension vegetable pathologist for typing. Most of the time late blight is not the problem (typically Septoria leaf spot or early blight), but better to be safe than sorry. Get those tomato and potato samples in for your free diagnosis. The first report of late blight for 2018 just came through this week. Be sure to take advantage of the PDDC’s free services while they last, but also remember that the PDDC needs paying samples as well to help fund the clinic’s operation. So submit early and often! As always, if you have questions about plant diseases and their management, or PDDC activities and services, feel free to contact me at (608) 262-2863 or pddc@wisc.edu. July 1, 2018 marks my 20th anniversary as director of the UW-Madison/Extension Plant Disease Diagnostics Clinic. It really seems just like yesterday that I started at the clinic. I remember being so excited about being asked to interview for the position, but terrified that I wouldn’t be hired because my diagnostic background was very limited. I felt better after I gave my interview seminar and Tom German (a virologist in my department) commented how he didn’t see how I could have given a better talk. Craig Grau (the department field and forage drop Extension specialist and my boss at the time) was also incredibly supportive, and Jennifer Parke (my previous boss in the department) wrote me (from what I was told) a “perfect” letter of recommendation. Eventually the stars aligned, I was hired, and I was off to the plant disease diagnostic races on July 1, 1998. I had only two weeks of overlap with Sr. Mary Francis Heimann (my predecessor in the clinic) and I tried to sop up as much of her knowledge as I could in that short period of time. After that, it was sink or swim. In particular, I was forced to learn a lot about ornamental diseases (the bulk of my samples even to this day) very quickly. Everyone in my department, and also Phil Pellitteri (the UW-Madison/Extension insect diagnostician in the UW-Madison Department of Entomology), was very supportive as I consulted with folks about plants, diseases and insect pests that I was unfamiliar with. I have learned a lot with everyone I have interacted with over the past 20 years and continue to do so even now. The PDDC’s physical facilities have evolved over the years as well. My original clinic space was a small lab and office on the second floor in Russell Labs. I remember one day when so many samples arrived that I had to leave them in a pile on the floor because there wasn’t enough counter space to organize them. And then there was the 8 ft. Douglas fir that I had to drag into the hall for several days so I could work in the lab and then haul it back into the lab each night so the custodial staff wouldn’t haul it to the dumpster. Eventually, I moved to the clinic’s current location in Rm. 183 Russell Labs, about three times the size of my original space. With the arrival of soybean rust into the US in 2004, I added clean space in the basement of Russell Labs so I could pursue the molecular diagnostics needed to detect the pathogen. I added a new office just a few years ago and now have about four times my original space. With renovations, I and my staff have created an efficient and productive work space. And speaking of staff, I have had the best over the years. The first addition to the clinic was Lynn Williamson, a returning adult undergraduate, who worked for several years as a student hourly in the PDDC. As my funding became more stable (with increased clinic revenues and federal funding through the National Plant Diagnostic Network), Ann Joy (who I had worked with previously in the department) joined the clinic as the Assistant Diagnostician, providing general support and initiating our foray into molecular diagnostics. With Ann’s retirement, Sean Toporek joined the clinic as her successor and expanded the PDDC’s molecular diagnostics over his roughly two year tenure. With Sean’s decision to pursue graduate school (his MS at the time and now his PhD), Sue Lueloff joined the clinic and our molecular diagnostic program has exploded. Over the years, an army of dedicated undergraduates have worked (and kept me young) in the lab culminating this year with John Lake (my student hourly) and Stephanie Salgado (a Memorial High School intern hired through the TOPS/AVID program). Ann Joy continues her presence in the clinic doing data entry and Dixie Lang recently joined the group to provide her magical IT expertise and clinic website (https://pddc.wisc.edu/) and social media (@UWPDDC on Facebook and Twitter) support. Everyone I have worked with over the years including new Plant Pathology faculty and PJ Liesch (Phil Pellitteri’s successor in the Insect Diagnostic Lab), continue to help me learn and do my job. Clinic activities have expanded over the years. In addition to diagnosing plant diseases (on average about 1500 samples per year), the clinic provides outreach on plant diseases throughout the state and also nationwide. I routinely give disease talks (a record 104 in 2017) particularly providing support for home gardeners and professionals in the horticulture arena. I am particularly grateful to county UW-Extension agents/educators (like Lisa Johnson of Dane County UW-Extension and Diana Alfuth of Pierce County UW-Extension) who have been willing to collaborate with me to provide programming. I’ve had the pleasure of doing television (on the late Shelley Ryan’s “Wisconsin Gardener”) and radio (on Larry Meiller’s “Garden Talk”) under the moniker “Dr. Death” (a nickname that I acquired at Garden Expo years ago and that makes me smile every time I hear it). I am also pleased to have been involved in the development of the “University of Wisconsin Garden Facts/Farm Facts/Pest Alert” fact sheet series (https://pddc.wisc.edu/fact-sheet-listing-all/). I continue to enjoy instructional activities at the UW-Madison including helping Bryan Jensen with his “IPM Scout School” course and conducting my summer “Plant Disease Diagnostics Practicum” course. It’s been a great 20 years at the PDDC and I don’t see myself retiring anytime soon. I still have too much I would like to do. Diagnostics, my outreach activities and my fact sheet work still call. In addition, I am currently working on plans for an outdoor plant disease laboratory (in collaboration with James Steiner of the UW-Madison Department of Planning and Landscape Architecture) that I would like to see to completion. And it has always been my goal, time permitting, to have a more active research program in my department documenting new pathogens (new hosts for Verticillium anyone?). I am excited as I enter my third decade in the PDDC and look forward to whatever challenges come my way. As always, if you have questions about plant diseases and their management, or PDDC activities and services, feel free to contact me at (608) 262-2863 or pddc@wisc.edu.